The ability to effectively and intuitively navigate and browse online catalogues is essential for today's online shopper. Research shows that effective and optimized browsing capabilities significantly increase customer satisfaction and user engagement, not to mention generated revenue. Optemo Faceted Navigation has provided an excellent ROI for our clients. When tested against other leading solutions, Optemo's solution has demonstrated a significant increase in customer satisfaction and conversion rate. Multi-select navigation: With Optemo Faceted Navigation, your customers can easily select multiple product types, brands or colors all at the same time. Sliders: For many product attributes, such as price, you do not want to limit your customers with narrow bounded ranges. Optemo lets you create intuitive sliders for any of your continuous attributes. Visual guidance: Particularly when you have an extended product catalogue with a long tail, it is important to help customers see how products are distributed. Visual cues such as distribution and heat maps have proven to be very effective in aiding customers to avoid failed searches while allowing them to learn about the product space. Auto-generated ranges: Setting ranges for continuous features is a tedious and time consuming task. Moreover it has to be repeated frequently since the data changes constantly and changes should be reflected in the facet ranges. Optemo has developed a proprietary algorithm for automatically computing ranges based on the data. These ranges can be additionally configured by merchandising and content teams. Search Engine Optimized: Optemo's navigation is text-based, not image-based. In addition, navigation pages are created with search engine friendly URLs and have descriptive titles that accurately denote the page contents. This means that that keyword relevancy on your website is increased, giving your online store additional SEO optimization. Creating and adjusting facets based on user feedback: Facets are powerful navigation tools but they also take up valuable real estate on your pages. It is important to have a thorough and up-to-date understanding of how facets are used in each department and create or order them accordingly. Optemo's Merchant Resource Center can be fully integrated with your analytics solutions, enabling you to track and monitor facet usage in one place. You can then choose to configure facets manually or set performance based rules for auto-adjustments. Optimized for product families: Grouping product families make the search and navigation much better and let you combine navigation functionality with recommendations. By grouping different colors or sizes, you make browsing much easier for your site visitor. 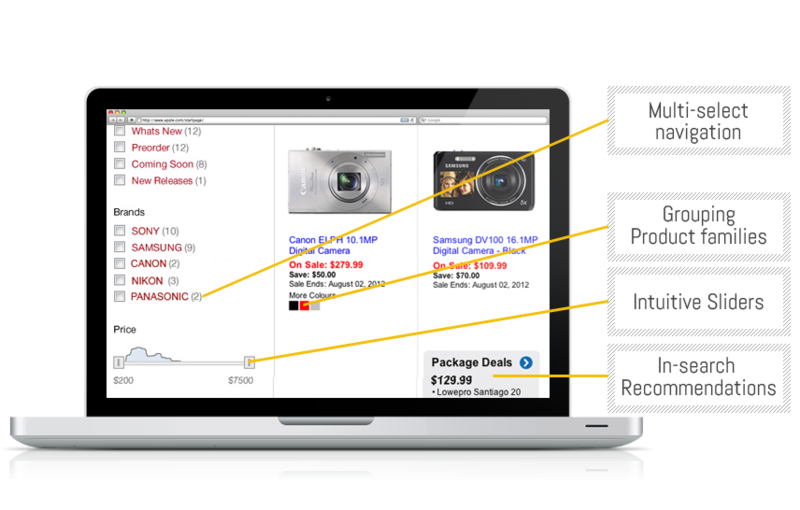 Moreover, by grouping bundles and similar products you can implicitly recommend products to your customers. Your merchandising teams can configure the grouping and pick which products in the family should be displayed with certain search criteria. Creating facets from structured and un-structured data: Do you want to easily and quickly create top-viewed (derived from your analytics) or most-liked (derived from your Facebook API data) facet? Optemo integrates and crawls well beyond your product feeds. You can create almost any facet you can imagine! Customizing facets for different departments and customer segments: For your savvy customers you might want to display a longer, more complex set of facets, whereas you want to help your other site visitors with a short but essential list of facets. Optemo faceted navigation lets you easily customize and configure facets for your customer segments and specific departments. The customer profile can be identified based on interactions and stored in the browser cookie or user login.